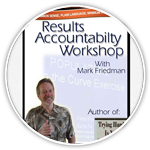 Instructions for Setup, Logistics, Materials and Preparation The two day Training for Trainers and Coaches workshops require preparation that is different from Results Accountability 101 sessions. This page tells you what you need to know to prepare for this training. Many thanks in advance for your help! A pre-training conference call will be needed ahead of the training to confirm the times set out in the agenda and consider any adjustments which may be necessary. Participants will work in groups of 4 “learning allies.” Each group will need its own table, flipchart and flipchart stand and set of markers. Participants are asked to answer the questions on the Results Accountability Self Assessment Questionnaire (see below). Participants are asked to spend at least 1 hour playing with the website: www.raguide.org. Click on the Index of Questions and find something that looks interesting. Review the Index of Tools and review instructions for at least one exercise or technique. Recommend review of the “Leaking Roof” or “Whole Distance” exercises. 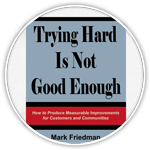 Participants are encouraged to read Trying Hard Is Not Good Enough (available from www.resultsleadership.org), and to bring the book with them to the workshop. Data: For the Community-wide Population (e.g. all children, all elders) Turn the Curve exercise: the group will need 4 or more indicator baselines with room on the x and y axis for forecasting. 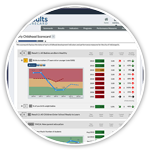 An existing state, county or city Quality of Life or Children’s Report card can be used if it provides graphed baseline data for 4 or more indicators. Data: For the Program and Agency Turn the Curve exercise: staff should bring (if possible, but not required) a list of key performance measures used by their organization and real data for at least one lower right quadrant measure.